Mastered by Bernie Grundman and Bob Donnelly from the Original Analog Master Tapes! Numbered Limited Edition 100% Analog 180g Vinyl LP! Limited To Only 3000 Numbered Copies! 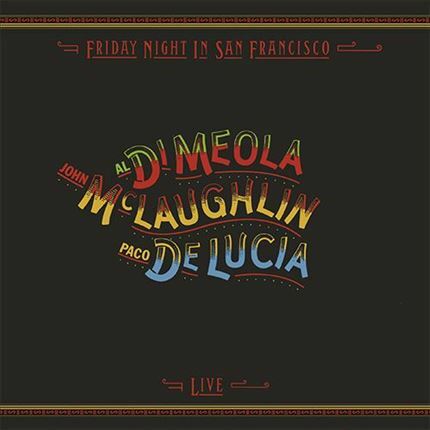 Friday Night In San Francisco is a 1981 live album by Al Di Meola, John McLaughlin and Paco de Lucia. It was described by jazz author and critic Walter Kolosky as "a musical event that could be compared to the Benny Goodman Band's performance at Carnegie Hall in 1938...[it] may be considered the most influential of all live acoustic guitar albums. All the tracks except Guardian Angel were recorded live at The Warfield Theatre on December 5, 1980 in San Francisco. 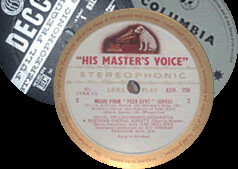 This debut recording on Columbia Records became a landmark recording that surpassed the two million mark in sales. The three virtuosos in the Trio toured together from 1980 through 1983. Ah the Mediterranean... Filled with fine foods, wines, beautiful people, and the inspirational style of music that descended upon the able fingers of these guitar giants. This is by far one of the hottest guitar albums ever to bless sweet vinyl. Al Dimeola, John McLaughlin, & Paco Delucia play classical guitars (the kind with the nylon strings) in a flamenco / jazz style that will blow your socks off! Paco de Lucia was a Spanish flamenco guitarist, composer and producer. A leading proponent of the New Flamenco style, he helped legitimize flamenco among the establishment in Spain, and was one of the first flamenco guitarists to have successfully crossed over into other genres of music such as classical and jazz. De Lucia was noted for his fast and fluent finger style runs. His collaborations with guitarists John McLaughlin and Al Di Meola saw him gain wider popularity outside his native Spain. • Mastered by Bernie Grundman and Bob Donnelly from the Original Analog Master Tapes! • Numbered Limited Edition 100% Analog 180g Vinyl LP! • Limited To Only 3000 Numbered Copies!